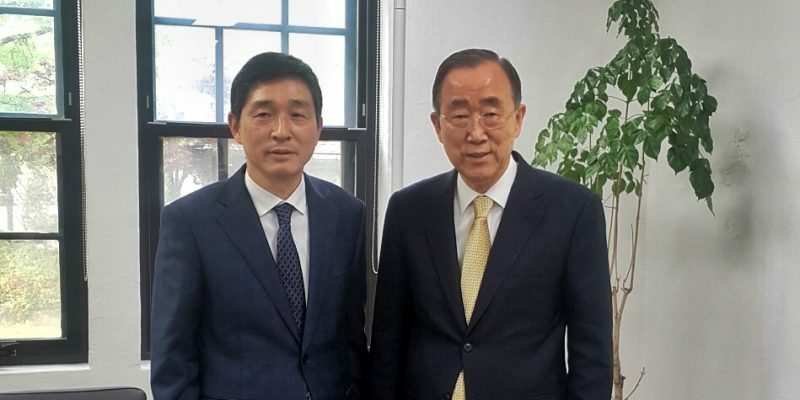 The Co-chairman of the Ban Ki-moon Centre for Global Citizens, former UN Secretary General Ban Ki-moon met the Secretary General of the ASEAN-Korea Centre Lee Hyuk on April 30th. Mr. Ban Ki-moon congratulated the 4th Secretary General of the ASEAN-Korea Centre on his inauguration that took place on April 16th. Previously, Mr. Lee has served as the Ambassador at the Korean Embassies in the Philippines and Vietnam. ASEAN-Korea Centre was established with aims to enlarge trades, promote investments, enhance cooperation on culture and tourism, and to activate human exchanges between Korea and the ASEAN countries. ASEAN consists of Brunei, Cambodia, Indonesia, Laos, Malaysia, Myanmar, the Philippines, Thailand, Singapore, and Vietnam. Mr. Ban also encouraged the ASEAN-Korea Centre to make continuous efforts to build a stronger, sustainable partnership between the ASEAN countries and Korea. The ASEAN-Korea Centre is currently accepting applicants for the 2018 ASEAN-Korea Youth Network Workshop that will be held in two places, Seoul and Manila, on July 2nd-12th. The deadline for the application submission is May 24th.